The struggle between iPhone and Android users is as old as the world, and both sides like to believe that their smartphone is the best. What I always tend to say is: there is no perfect smartphone and there is always compromise. Every user has different needs and in this fight between the futuristic smartphone OPPO Find X and the latest iPhone, we analyze the strengths of each device to help you choose the one that best suits you. Both smartphones are made with two glass panels that sandwich the metal structure. This makes both the iPhone XS and the OPPO Find X extremely fragile smartphones. Given the amount of money needed to purchase either, you won't want to drop them, believe me. In favor of the iPhone XS we find the IP68 certification against the water and dust damage, while it is better to keep OPPO Find X away from water splashes especially with the motorized camera mechanism. Both phones have a striking look and the final decision is a matter of taste, but I personally love the futuristic look of Find X. The curved glass on both sides, the notch-free display that covers almost the entire front and the two colors offered by OPPO are unique. In hand, the smartphone is comfortable and manageable. In this regard, if you like to use your smartphone with one hand, the iPhone XS is much more compact. Unfortunately, the retractable mechanism for the cameras on the Find X collects a ton of dust and dirt. You will often find yourself blowing on the cameras before taking pictures. Despite the glass construction of both smartphones, only the iPhone XS has wireless charging and NFC. It will therefore not be possible to use the Find X with Google Pay when it arrives in your country. According to what has been leaked, the iPhone XS has a 2658 mAh battery while the OPPO Find X has a 3730 mAh battery, but do not be fooled by the numbers, the battery life is comparable and neither smartphone will leave you scrambling in the middle of the day. What is disappointing, however, is the presence of a standard charger included in the box of the iPhone, despite the cost of the device. You would have to pay Apple extra to buy the quick charger and you would still not reach the charging speeds of the Find X and its VOOC Flash Charge. This situation gets even worse for the iPhone if you compare it to the Lamborghini Edition of the Find X, which has a smaller battery (3400mAh) but takes even less time to recharge thanks to the Super VOOC Flash Charge. Regardless of which smartphone you decide to buy, you'll have to give up two of the features most loved by users around the world. Neither smartphone has a fingerprint reader, as both rely solely on using a 3D face recognition system. The Apple smartphone, in this case, slightly wins in terms of speed but the Find X defends itself well by being comparable to the FaceID of iPhone X. The other feature you'll have to say goodbye to is the 3.5mm headphone jack. OPPO luckily includes the jack to USB-C dongle in the box, whilst Apple will not do this anymore. Get your wallet out once again. What distinguishes the two smartphones is the multimedia experience. The OPPO Find X has a beautiful 6.42-inch curved AMOLED display with curved sides and a FullHD+ resolution. Above all, though, it has no notch, so the experience when watching videos or during gaming sessions is amazing. It also has an always-on display, which is something the iPhone XS lacks. However, the lack of stereo speakers in the OPPO is a shame, whilst the stereo speakers on the iPhone XS sound better than ever. Bluetooth audio is great on both but the Find X supports high-quality advanced codecs such as AptX HD and LDAC. The SoC Apple A12 has much more to offer than Qualcomm's Snapdragon 845 inside the Android smartphone in terms of overall smartphone speed and gaming performance. 8.1 - Oreo Sorry, not yet available! ColorOS Sorry, not yet available! Not available Sorry, not yet available! 2.8 GHz Sorry, not yet available! Both smartphones have two rear cameras and a front module with 3D face tracking but the results are as different as possible. The OPPO Find X captures great shots in good lighting situations but quickly loses quality when the sun goes down. The Apple iPhone XS, on the other hand, has significant improvements over the previous generation and the first shots that can be seen by this device from those who already have their hands on it are quite special. Even in terms of video recording, the iPhone is the winner thanks to the 4K mode at 60fps with optical stabilization. Obviously, we will closely compare the shots of the two smartphones once the iPhone reaches our editorial office, but last year’s iPhone X was already better than the OPPO so we expect the result of this one to be clearly in favor of Apple. Which luxury smartphone do you prefer? 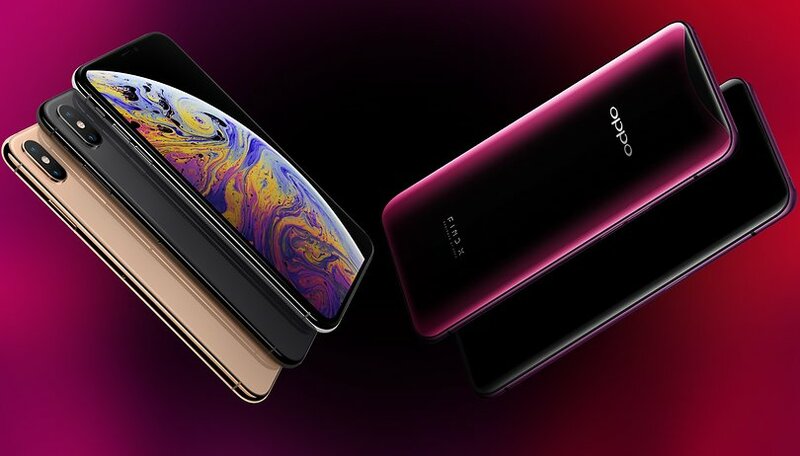 Choose “OPPO Find X” or “Apple iPhone XS”. Let me know in the comments if you prefer the peace of mind of the iPhone or the futuristic look of OPPO Find X!